Our SPOT.ph movie reviewer weighs in on the star-studded romantic dramedy. 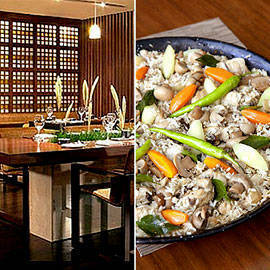 (SPOT.ph) From the same folks who made the star-studded, overblown mess that was Valentine's Day now comes the star-studded, slightly improved confection that is New Year's Eve. A romantic dramedy about two dozen men and women, boys and girls who learn lessons about love, hope, forgiveness and selflessness, New Year's Eve is a mixed bag of hits and misses whose intertwining stories are unapologetically manipulative and predictably schmaltzy-much like the holiday season itself. It's the morning of December 31, 2011 and New York is preparing for the annual ceremonial ball drop in Times Square. Present to ensure the success of the century-old tradition is city official Claire (Hilary Swank) and her team of policemen and technicians. Congruent to the ball drop is a party being catered by Laura (Katherine Heigl) with the help of perky assistant Ava (Sofia Vergara). And though this job will either make or break her promising career as a caterer, Laura is distracted by the presence of pop star Jensen (Jon Bon Jovi), the man who jilted her on New Year's Eve 2010. Also suffering her share of romantic angst is Hailey (Abigail Breslin), a teenager who's excited about being kissed at midnight in Times Square by the boy she's crushing on. Problem is, Hailey's uptight mom Kim (Sarah Jessica Parker) is determined to keep Hailey home for some major mother-daughter bonding time. Other storylines involve a mousy secretary (Michele Pfeiffer) trying to make up for years of lost time in one day with the help of a bike courier (Zac Efron); a cheerful singer (Lea Michele) who's trapped in an elevator with a holiday hater (Ashton Kutcher); a handsome record executive (Josh Duhamel) who's rushing to New York from Connecticut to keep a date with a mysterious lady; and so on and so forth. With a bewildering number of plot lines and cast members to juggle in the air, it's inevitable that director Gary Marshall would drop some of the balls of his latest holiday confection. As Valentine's Day made clear, Marshall simply doesn't have the skill level of fellow filmmaker Richard Curtis, whose luminously moving 2003 film Love Actually remains the standard by which films like Valentine's Day and New Year's Eve will forever be measured. Among the stories, situations, and ingredients which New Year's Eve would have been better off without are the race among expectant couples to deliver the first baby of the new year, the "been there, seen that" storyline about the guy who got cold feet on the eve of his wedding, and yet another clichéd discussion about the importance of finding "The One." Predictably, there's even a scene where an old man tells Josh Duhamel's Sam to listen to his heart and pay heed to serendipity. As for the music, I'm of the mind that Hilary Swank's speech about second chances would have been far more effective without the preemptive and intrusive score that accompanies it in the film. I also didn't care much for the inevitable rendition of "Auld Lang Syne" by a popular TV star. The song would have been more moving had it been performed by a more seasoned singer than the one you'll see and hear in the movie. These quibbles aside, I did like quite a few things about the film. As one who enjoys seeing how urban jungles are magically and cinematically transformed by the holiday season, I was captivated by the beautiful sight of post-Christmas Manhattan, particularly Times Square. As for the cast, I was moved by the twists and revelations involving the significant others of Halle Berry and Josh Duhamel's characters. Also divertingly fun was the scene-stealing Sofia Vergara, whose exuberant line delivery and revealing body language added much-needed spark to every scene she was in. Also worth a few chuckles are a couple of clips from the closing credits blooper reel, the best one being the one with an almost unrecognizable Cary Elwes as a doctor and the brilliant Robert De Niro as his dying patient. It puzzles me, however, why the filmmakers sandwiched the bloopers between shots which clearly show that the film isn't over yet. Why stop the viewer's ability to willingly suspend disbelief prematurely? What makes these ill-timed bloopers even worse is that they interrupted the flow of my favorite storyline from the film, the one involving Zac Efron and Michelle Pfeiffer's characters. Though their improbable mad dash to fulfill all of her new year's resolutions in a day was a tad derivative of The Bucket List and Eat Pray Love, what did end up onscreen made me wish that the film had given Efron and Pfeiffer more screen time. 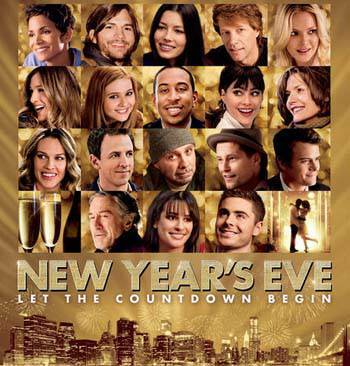 I'm pretty sure I would have liked New Year's Eve even more had the movie been only about them. RATING: 2½ out of 5 Spots âÂ€¢âÂ€¢.